Grind the dates to a coarse paste. Heat ghee and lightly fry the dates, crumbled mawa, coconut and sugar till the mixture is a solid mass. Add almonds and cardamom powder and continue to fry till the mixture leaves the sides of pan. Remove the mixture from fire. Pour the date-mawa mixture into a tray to cool slightly. Divide the mixture into even sized portions. 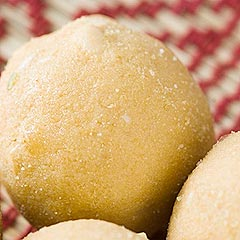 Shape each portion into a laddoo. Spread roasted poppy seeds in a flat plate; roll the laddoos in the poppy seeds and serve. Thank you Davinder bhai for your explanation. How did it turn white if it is made out of khajoor?Is it just a picture or you have mixed something in it? We have so much khajoor in Saudi. Kajoor is a treat on it's own and ladoo will be a bigger treat.Thank you. Hi davinder!,this laddoo recipe is opt for kids-who don't like dates.They will luv to take dates done as sweets.